RRP: £101.64 (+VAT). OVER 40% OFF! 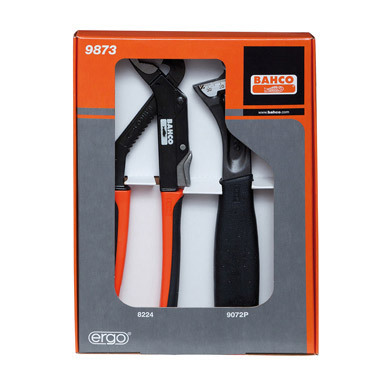 Bahco 9873 plumbers adjustable wrench and pliers set - includes the very popular Bahco 9072P adjustable wrench and Bahco 8224 water pump pliers. This is a superb value-for-money set that is perfect for the professional plumber! Precision-hardened & anti-corrosion treated, these quality Bahco wrenches can withstand high torque loads. Overall length: 10 inch / 257mm. Long-life, tapered jaws and 15° head angle with no protruding shank when fully open. Fixed jaw has left-reading measurement scale in mm. Comfortable thermoplastic handle and larger grip width. Bahco 8224 slip joint plier with outstanding jaw opening and depth. With both flat and pipe-grip jaws. Ideal water pump pliers for plumbers! Overall length: 10 inch / 250mm. Self-locking jaws grip tightly at 3 points. Speedy one-hand setting by pressing a button on the handle. Can be adjusted with parallel jaws in 11 different positions. Made of chrome vanadium steel, anti-corrosion treated, with specially hardened jaws. Ergo handle combines thermoplastic surface with tough polypropylene to give maximum grip and comfort.